My name is Claire and I am a NaNo Nerd. I like to track my stats. I love the word count widgets (taps toe waiting impatiently for the NaNo site to roll out the official NaNo widget for us). For me, that’s part of the allure of NaNo–the sense of achievement when that published goal is met. Yes, it’s an Excel spreadsheet. Yes, it’s color-coded. I also tried to get the conditional formatting to work on the daily total column to put any day less than 1667 in bad girl red but Excel for the Mac is different than Excel for the PC and I’m a recent Mac convert. I let it go for the time being, though not without a niggle of chagrin. I am a numbers gal as I’ve stated many times on this blog. 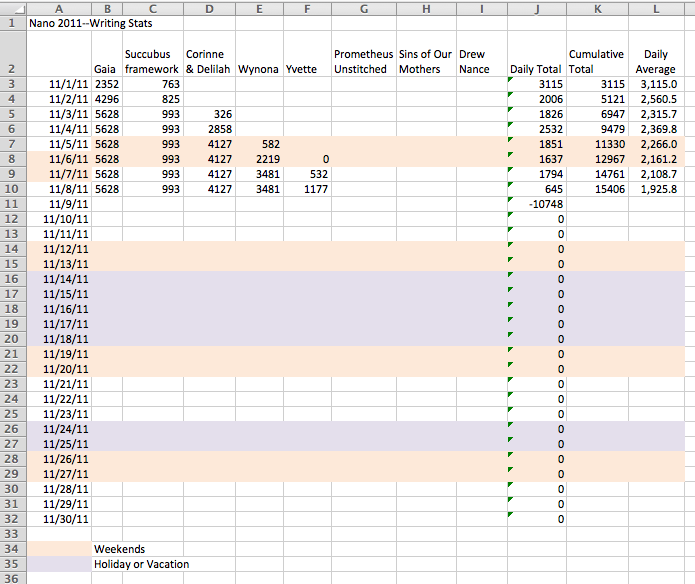 I convert most goals to metrics which makes NaNoWriMo my kind of challenge. My word meter at NaNoWriMo.org is always updated before I go to bed, sometimes multiple times per day. Progress feedback is good. I wished all aspects of writing were quantifiable. Can you imagine if the quality of books was as precisely quantifiable? We could go far beyond the crude five-star rating systems for reviews. Bestsellers would be based in part on the “Dewey-Times Index” or the DTI (I made that up). We’d deduct points for flaws in grammar, character development, originality, logic. We’d include degree of difficulty multipliers. Starving writers would compare their DTI’s and hire coaches to help them improve their scores. One difficulty of the DTI would be preventing the East German judge from colluding with the Soviet judge. Those of you who remember the Olympics of the seventies and eighties will understand my joke. Those born after that time, East Germany and the USSR are former countries…well, never mind. But I digress, as I often do. Points off my blog post for doing that. But that doesn’t mean I can’t nor shouldn’t measure the non-creative and objective parts of writing and reading. There certainly is a work ethic involved in transferring ideas to paper (electronic or tangible). So carry on with pride, you spreadsheeters! Keep databases to track your reads and/or your writes–your overall quantity, your pace, the percent make up of your choices by genre. Just don’t let the numbers overshadow the story cause whether it’s told in 50,000 or 50 words, it’s always the story that counts most. Every time I take a pause from writing, I have to update my wordcount on the NaNo site.